We have a blue moon this month. 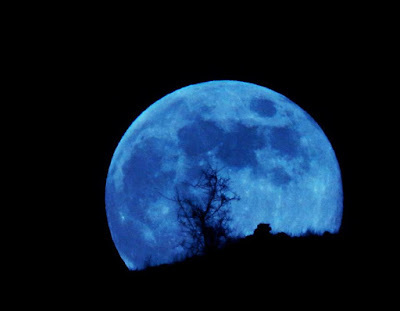 A blue moon occurs when two full moon occur in one calendar month. 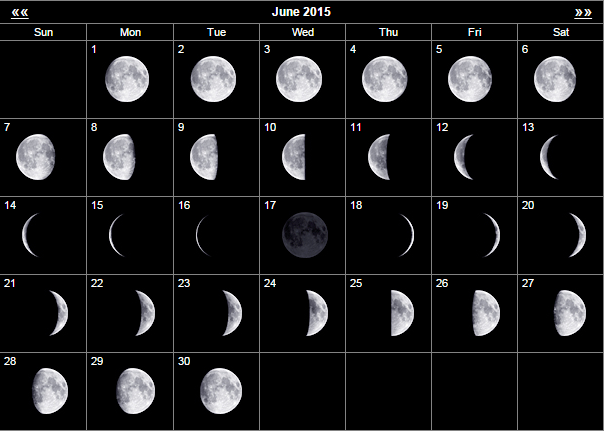 This July we had a full moon on 2nd July and are due another on 31st July 2015. This is a very rare event as we haven't had one since August 2012 and the next one is not due until 2018. We will actually have two blue moons in 2018, in January and March but this is obviously a very rare occurrence. 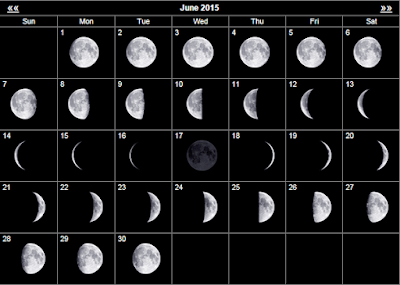 The next year of double blue moons is not until 1937! Beautiful pic is from earth sky.org, check out their website for lots of amazing astronomical facts! Obviously as our calendar is a man made way of measuring the days in the month, there isn't really any spiritual significance of us having two blue moons in one month. However I still think it is an interesting fact to note and cool for you if July is of significance to you to have two full moons this month! I think we can all agree that the full moon is always something to offer gratitude for and if we get two moons in one month then by my book that's cause for extra gratitude! 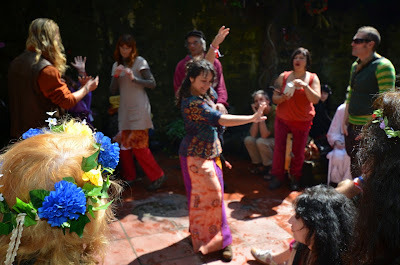 Our up coming Summer Solstice marks the start of a few months of intense energy ahead of us. The solstice not only represents the longest day but the time that our beautiful sun's rays are shining most directly and vertically down upon us. We can benefit from this wonderful energy and use this time, building upon the enhanced energy that we feel within ourselves and emanating all around us. The July full moon on the 2nd is the Full Buck Moon, Thunder Moon or Hay Moon, named for the abundance of nature at this time of year. This moon follows hot on the heels of the Litha or the Summer Solstice, our earth will literally will be crackling with super charged energy. The Supermoon in September comes the closest to us for 2015, being only 357,098 km or 221,890 miles away. Why does the super moon affect me? Crystal Charms and Goddesses for Healing which are you drawn to ? Emerging as I often do like a sleepy kitten from a long sleep when I have had these long stretches of migraines I feel drawn to sit and create so that is what I am going to do today, catch up on orders that need posting and make some new pieces. I would like to make some new healing charms I think so if anyone has any needs then please let me know, I love doing special pieces. 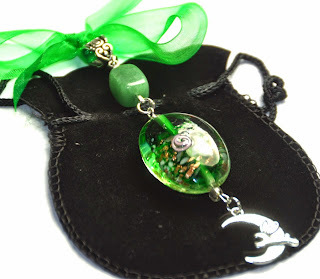 Each crystal and charm has its own story to tell and put together may be just the right combination for you to begin your own healing and transformation. First thing I am going to make this afternoon is a good luck charm for my daughter who has been studying so hard for her A levels. Aceso was the main Greek Goddess for healing. Indeed her name is said to mean curing. She was known for tackling the healing process, the root cause not just the problem itself, thus can be seen as the root of holistic medicine. We of course have a lot to learn from our ancestors in terms of the way we approach modern healing methods. She shared an altar with Aphrodite and Athena and was the daughter of Epipione and and Asclepius. Aceso also spelt Akeso knew the importance of maintaining good health as well as good hygiene in order to stay fit and well, something that was often neglected when looking to cure a specific disease or illness. 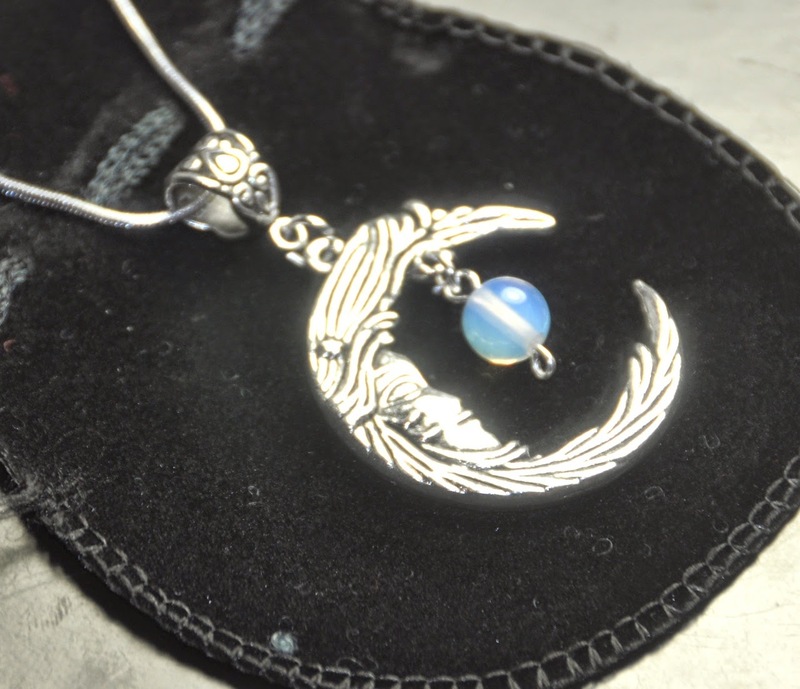 Many of the well known Moon Goddesses such as Aine, Brigid and Isis were known to be powerful healers. Brigid or Brigit was also said to be responsible for fertility and Aine was known for breathing life force into being. Aine is connected with lakes and healing wells. Water is extremely important as a healing aid and I cleanse all my crystals with water from the red spring at Chalice Well gardens in Glastonbury. I bless them all before they are sent out to you so that you may receive the full force of the healing power. The important thing to note when looking for healing is to find the right mix of things that are right for you and to remember that your biggest help is Mother Earth. 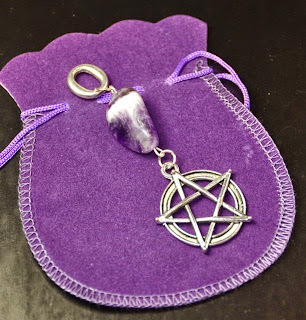 If you are drawn to a particular crystal, goddess, pentacle, stone, herb then there is often a reason for that. Modern medicine can often be used alongside traditional remedies and there is often no reason you cannot take both as long as you check with your healthcare provider. Our earth is a powerful healer and she has much to offer us as long as we give back in return. "Experiencing deep heartfelt connections to the Earth will bring us closer to understanding ourselves and trusting out intuition. 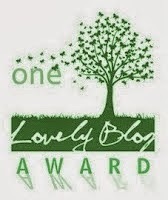 It will help us foster a sense of belonging and love for the Earth and all peoples of the Earth. To live in harmony with the earth, we need to remember our connection to her." 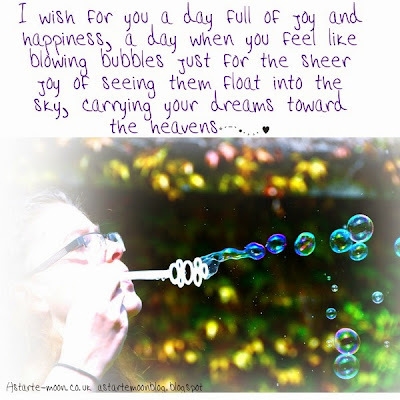 As our new moon begins to wax the world is your oyster.Enjoy the increasing energy our earth is giving you right now, start each day smiling! Each new moon we have brings with it an air of hope I find, there is something about our Mother Earth at this time of the month that is like no other. We are now in the time of the Waxing Crescent moon, a time of incredible energy and growth. Somehow the grass verges look greener, the sky looks brighter, nature is vibrant with hope and we are too. Embrace the feeling and use this energy to pour into whatever projects you have on the go right now. Wake each day with a smile on your face and a determination that today is going to be a good one. 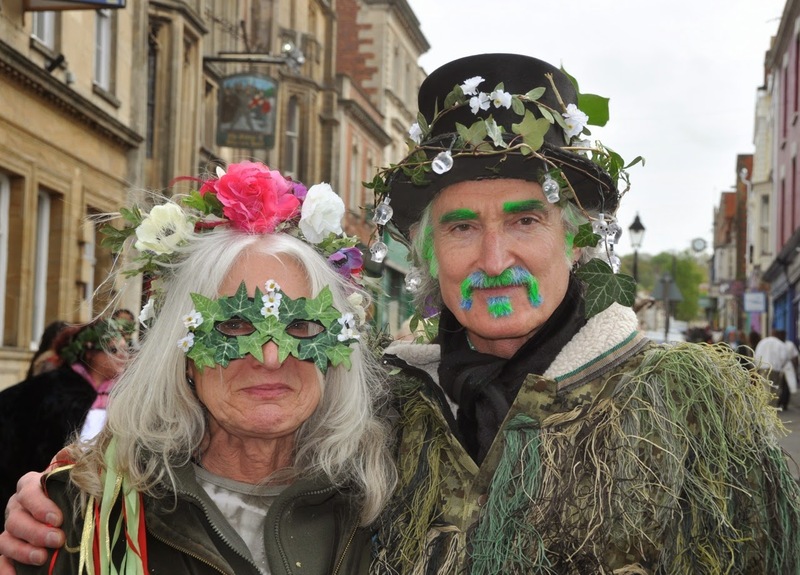 So I'm finally sitting down on Sunday afternoon to write a little about Beltane in Glastonbury this year, 2015. We had a lovely day and this year it stayed dry all day! The sun did try to shine on us a little to bring in the glorious start to summer but it was a very brief showing! 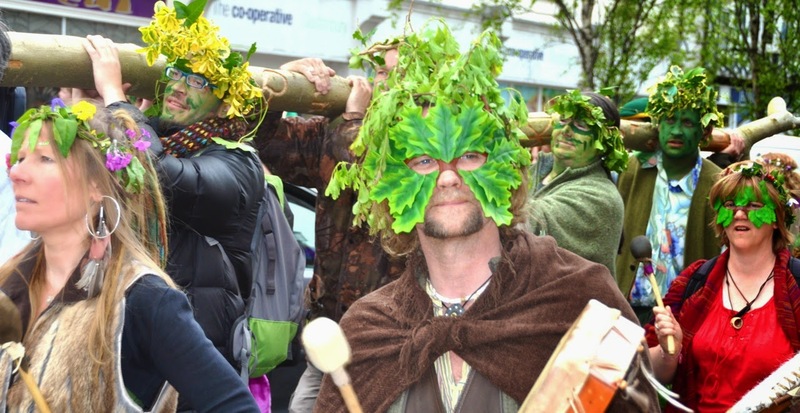 Beltane celebrates the start of the summer on the Pagan Wheel of the Year and it is celebrated in great style in Glastonbury with much joy and merriment. 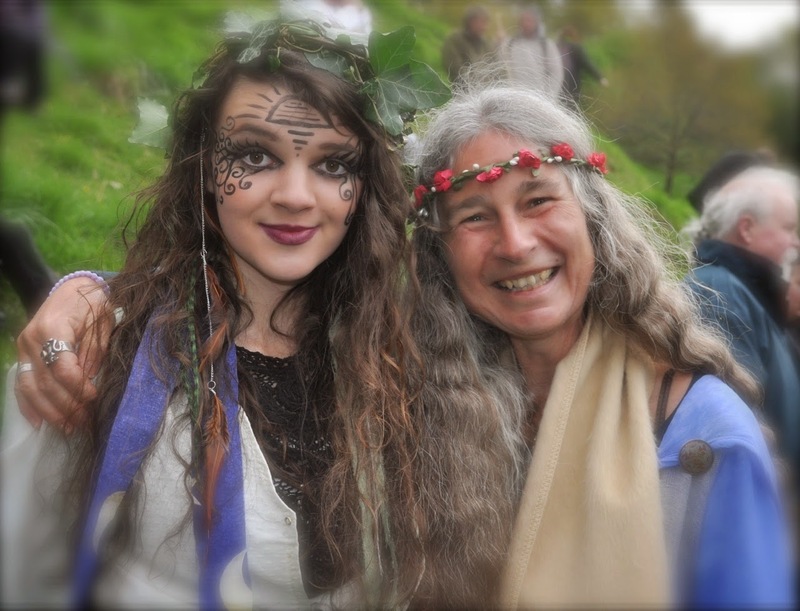 This follows ancient traditions, Beltane always was a festival of great joy, a time for honouring all of our Mother Earth's bounty and the love and fertility that is all around us at this time of year. 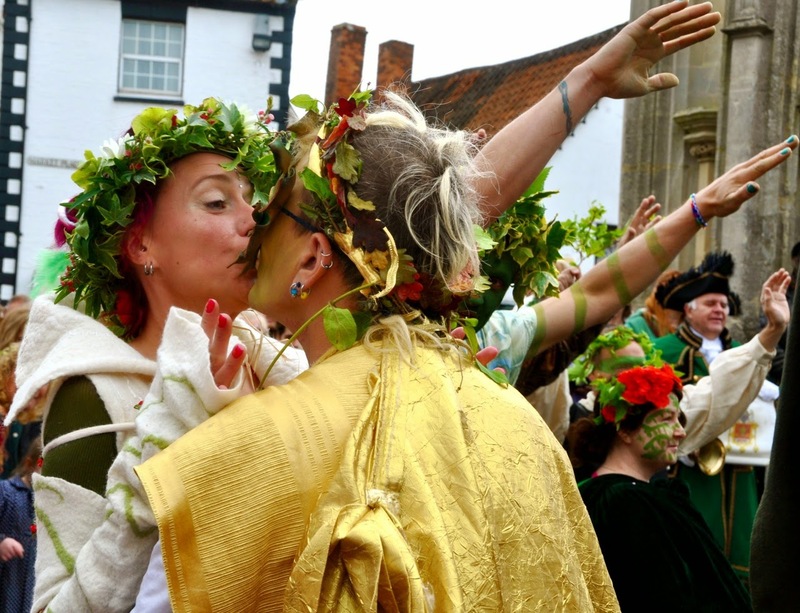 Beltane is not for the shy it is for celebrating love and not being afraid to express that love. We started the day with a beautiful ceremony in the Chalice Well Gardens. Having driven down just for the day I didn't think I could make it through the day getting up at 2am so we had to forgo the dawn ceremony on top of the Tor which was a shame. 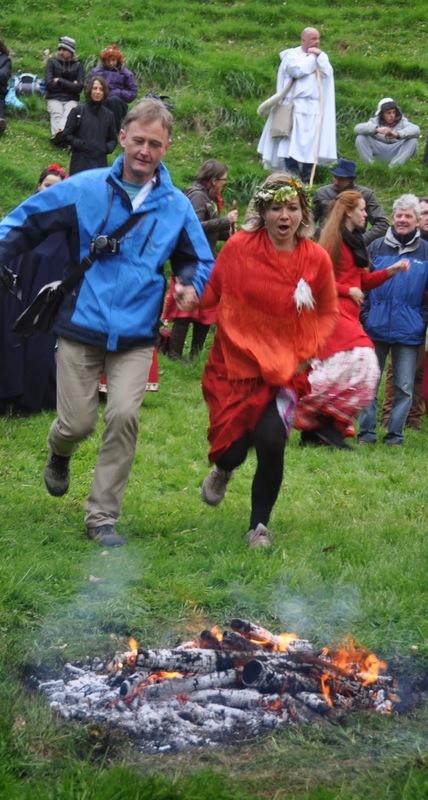 The Chalice Well was beautiful as usual and the fire jumping occurred with great gusto this year which was immense fun! I met Tessa and Sosha there, both looking beautiful in this pic. 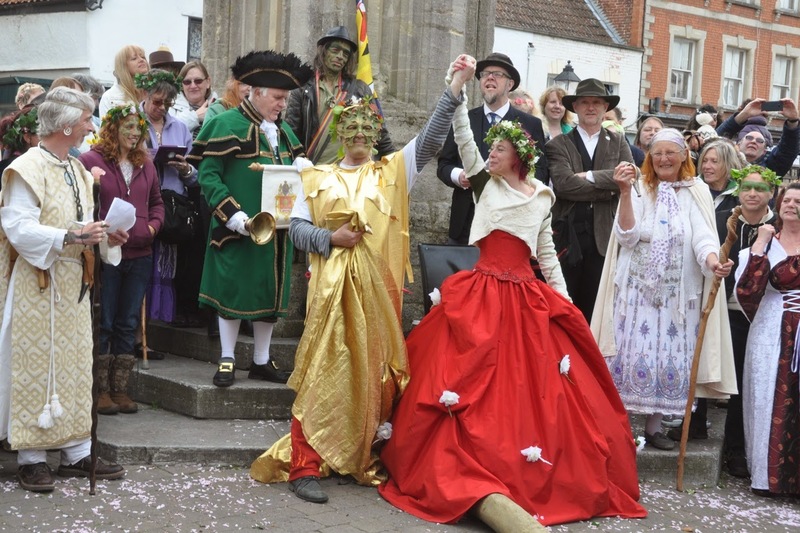 The crowning of the May King and Queen and the entertainment in the Town Square was as usual hugely enjoyable with lots of folk joining in with a song to contribute. 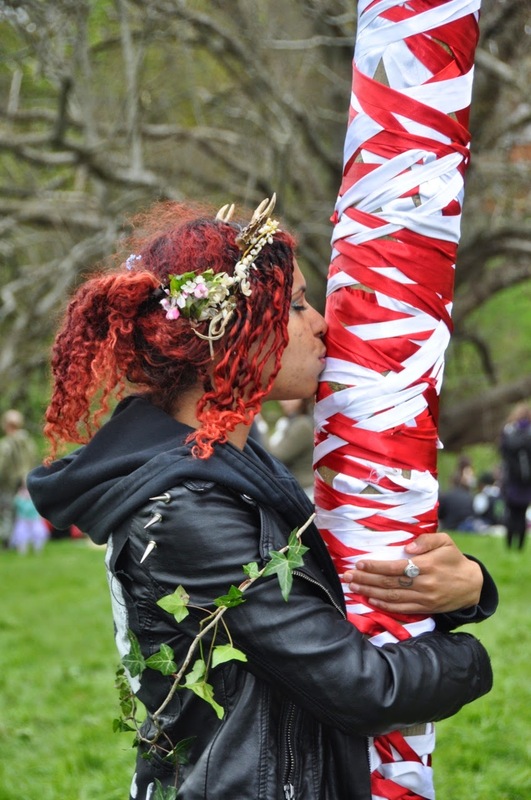 We the processed up to the White Spring for the blessing of the May Pole. I chatted to Julie Ann there who makes many of the handmade cloaks being worn today. www.avaloncloaks.co.uk. 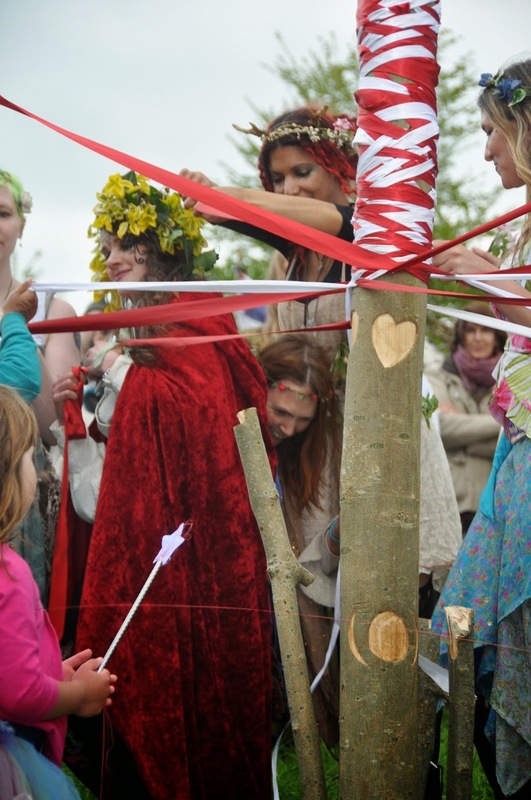 We then made our way unto Bushey Coombe for the ceremony and Maypole dance. I hope you enjoy the photos and if you were there please do drop me a line. If any of you are in them and you would rather I take them down then please do say and I will take them down right away. Photographs owned by myself. Please feel free to use them for personal use, any professional use please contact me for prices.